This weekend I was in Kigali to commemorate the 25th anniversary of the genocide in Rwanda. It is incredible to think that already a quarter of a century has passed since the horrors of 1994, where 1 million Tutsi people were murdered by their Hutu neighbours over a 100 day period – a faster killing rate than Hitler achieved with all the industrial mechanisms of the Holocaust. The event is significant in more ways than one. It reminds us that we can never afford to be complacent, and that evil knows no bounds. And we must never forget that unlike the Holocaust, which was prosecuted under the cloak of the Second World War, the Rwandan genocide unfolded before our very eyes, under the glare of the media, with the world as a witness. We saw. We knew. We did not stop it. And that will forever be to our shame. And yet, only 25 years later, in the shadow of intense trauma, a remarkable story is emerging: a story about healing and catharsis; about forgiveness and reconciliation; and most of all, about refusing to dwell on the past, and looking positively to the future. The commemoration activities this weekend focused around the flame-lighting ceremony at the memorial. The flame will burn for 100 days - the time it took in 1994 for about a tenth of the country to be massacred. 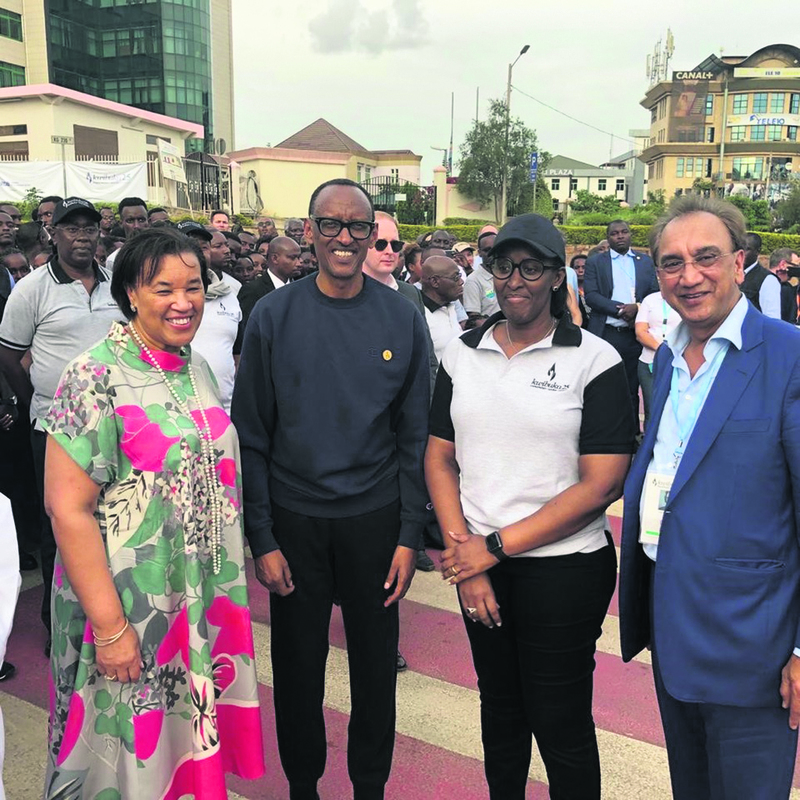 President Paul Kagame then led a vigil at the Amahoro National Stadium, which was used by United Nations officials to try to protect Tutsis during the killings. I had the honour of walking with the President during the walk of remembrance from parliament to the stadium. About 2,000 people were said to have joined the march. A number of dignitaries, including 14 Heads of State were present for the service. This included Prime Minister Charles Michel representing the former colonial ruler, Belgium and European Commission President Jean-Claude Juncker. 25 years later, Rwanda is Africa’s great success story. I often refer to the country as the continent’s ‘rising star’. Not only has it managed to smooth over ethnic divisions through policies designed to promote cohesion and a unified Rwandan identity, the country's economy is booming, life expectancy has risen, human capital is being transformed through education and women’s rights are one of the most advanced in the world. Much of this transformation is done to the sterling leadership of President Kagame who I have had the pleasure of working with over the last few years. Despite being one of the smallest countries on the continent, Rwanda has sustained one of the fastest rates of economic growth of any country in the world, with GDP increases averaging around 7 per a year. Its business-friendly environment coupled with a zero-corruption policy is attracting trade and investment from far and wide. As the Prime Minister’s Trade Envoy to Rwanda, I was pleased to campaign with Baroness Scotland QC, Commonwealth Secretary-General, for the next Commonwealth Heads of Government Meeting (CHOGM) to be held in Rwanda in 2020. CHOGM will be a huge opportunity for Rwanda to showcase its tremendous potential. I am genuinely excited at connecting UK businesses to the opportunities there because I know that these will be followed through swiftly and efficiently. Rwanda abides by the precept: where there is a will, there is a way. I always say, if you want something done, ask the Rwandans! Even Prime Minister Narendra Modi remarked on this last year when he visited Rwanda to pay tribute to the progress made after the genocide. My Guru, Morari Bapu will be hosting a 9 day recital in Rwanda from 20th to 28th April to touch on these sentiments and commemorate the 25th anniversary of the genocide, whilst also celebrating the positive transformation that has taken place in the country. The Katha will be held at the Kigali Convention Centre where over 1000 people are expected to attend from across the world. Bapu will be received personally by President Kagame and Bapu is expected to use the Katha to speak on pain and forgiveness, which continues to burden many Rwandans. The Katha is widely welcomed by the Rwandan community to help enforce the importance of peace and compassion. Rwanda teaches us many lessons. Amid the sadness of remembrance burns the flame of hope. Visit Rwanda and you will see what hope can achieve. You will be amazed by the transformations. You will be inspired by the country’s strength and vision. You will fall in love with the people who have overcome so much adversity, against all odds - and in such a short time.